Summary: Since the 1980s, Uganda has been in a state of civil war, with the nation’s leadership violently contested by a revolutionary force known as the Lord’s Resistance Army (or L.R.A.). The fighting is fiercest in the North of Uganda, and there the L.R.A. recruit many of their soldiers by abducting children from refugee camps and homes in the poverty-stricken villages, where electricity and running water are still luxuries known only to a few. However, in the village of Patongo, located deep in Uganda’s war zone, a group of students (many of whom escaped from the clutches of the L.R.A.) struggles to rise above the violence and desperation that surrounds them. Each year, a student music festival is held in Kampala, Uganda’s capitol city, in which children from around the country compete for prizes in performing traditional music and dance. When the students of the Patongo Primary School are invited to compete for the first time, the children are both thrilled at their opportunity and determined to prove that in a place of violence and want, creativity and talent can still take root. 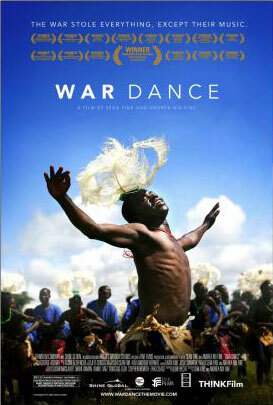 War Dance is a documentary about the Patongo Primary School’s long journey to the Kampala Music Festival and the experiences, both good and bad, which informed them.